LINKING DOWNTOWN WITH ANACOSTIA: Planned by District officials as early as 1946, the Southeast Freeway received a boost when a 1955 report by De Leuw, Cather and Company proposed the link as part of the $272 million, 18-mile Inner Loop project in a 1955 report. District officials pushed successfully to have the Southeast Freeway, along with the rest of the Inner Loop, as part of the Interstate highway system signed into law by President Eisenhower the following year. The law provided for 90 percent financing for the freeway, with the remainder coming from District funds. Originally designated I-63N in early 1958, the American Association of State Highway Officials (AASHO) rejected this proposal by District officials and suggested an I-395 designation for the link. The District responded with a proposed I-695 designation as a connecting link between two other Interstate highways; AASHO approved the new designation in July of that year. As originally planned, the $29 million, 2.2-mile-long Southeast Freeway was to be built as an elevated eight-lane freeway atop Virginia Avenue. It was to connect the Southwest and Center Leg freeways (both part of the current I-395, originally I-95) to the East Leg Freeway (proposed I-295). A massive four-level interchange - nicknamed "Interchange C" from the De Leuw, Cather and Company report - was to form the southeast corner of the Inner Loop project where the Southeast and East Leg freeways were to join. From this point, traffic bound for the southbound Anacostia Freeway was to continue south over a new dualized 11th Street Bridge as it does today. Traffic bound for the northbound Baltimore-Washington Parkway (MD 295) was to take the East Leg (I-295) and New York Avenue Industrial (US 50) freeways. East of "Interchange C," the Southeast Freeway was to transition directly onto Pennsylvania Avenue. Construction of the elevated freeway required the condemnation of 165 residential dwellings and an unknown number of commercial establishments. When completed, residents feared it would create a "Chinese wall" between the Capitol Hill, which was undergoing gentrification at the time, to the north and the Southeast neighborhoods where public housing was concentrated near the Washington Navy Yard. However, even as construction loomed, many families knew about the condemnation of their homes with only a few months' notice. The lack of suitable low-income relocation housing also complicated matters. BUILDING THE LINK: The first section of the Southeast Freeway opened in 1963 as a pair of ramps connecting to South Capitol Street; it actually was part of the Southwest Freeway (I-395) project. Meanwhile, construction on a half-mile-long segment of the mainline expressway continued east to 6th Street SE; this segment was completed in 1965. Further construction of I-695 was delayed by the lack of a final decision on the future of "Interchange C" and the East Leg freeway. In 1968, after several years of heated protest about condemnation procedures, the District government reached a compromise agreement that authorized construction of the Southeast Freeway east to Barney Circle (Pennsylvania Avenue), freeway approaches to the 11th Street Bridge, and a downsized "Interchange C" that would connect the two freeways. There were no provisions in the new "Interchange C" for the East Leg, whose construction was deferred indefinitely. The final short section of the Southeast Freeway connecting "Interchange C" with Pennsylvania Avenue was completed in 1974. With the cancellation of the Barney Circle Freeway in 1996, the interchange with Pennsylvania Avenue forms the primary connection between the Southeast Freeway and the Kenilworth Avenue Freeway / Baltimore-Washington Parkway corridor (DC 295-MD 295). An underpass beneath Barney Circle was part of the project, but today this underpass - which was to accommodate six lanes of I-695 traffic - stands mostly unused except for traffic bound for Robert F. Kennedy Stadium. 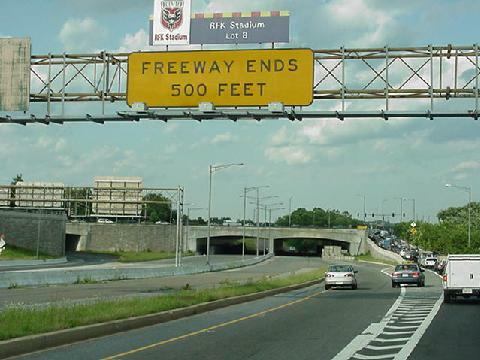 According to the District of Columbia Department of Transportation (DDOT), the Southeast Freeway carries approximately 90,000 vehicles per day (AADT). REBUILDING THE FREEWAY… OR GETTING RID OF IT? As early as 1993, District officials considered dismantling the eight-lane elevated sections of the Southeast and Southwest freeways to help re-reestablish Washington's historic street grid system. The "Legacy" proposal offered by the National Capital Planning Commission (NCPC) proposed a four-lane underground tunneled freeway from approximately 7th Street SW (where the Southwest Freeway transitions from an open-cut depressed freeway to an elevated one) to approximately 7th Street SE (just before the 11th Street Bridge approach). An arterial boulevard built to replace the elevated freeway - which was to be built in conjunction with the tunnel - was intended to reconnect communities south of the freeways. However, these plans were pushed aside in 1998 when the DDOT began a $30 million project to rebuild the elevated Southeast Freeway. The project was part of $400 million in work to rebuild the city's freeway system, including elevated sections of the Southwest (I-395) and Whitehurst (US 29) freeways. Nevertheless, some District officials continued to favor tearing down the Southeast Freeway even as reconstruction work neared completion in 2000. PLANNING A NEW CONNECTION TO 295: In 2004, the DDOT began studies to rebuild the 11th Street Bridge and its approaches. The twin bridges, which carry the I-295 designation, carry eight lanes of traffic between the Anacostia Freeway and the Southeast Freeway (I-695). Currently, ramps exist between the bridge (I-295 connector) and I-295, but there is no connection between the bridge and DC 295 because the Barney Circle extension of I-695, which was to supply the missing movements between downtown and the Baltimore-Washington Parkway, never was built. The upstream bridge (11th Street Bridge) would be expanded to eight freeway lanes - four in each direction - to serve the connection between the Southeast and Anacostia freeways. Unlike the existing setup in which there are no breakdown lanes, there would be a 12-foot-wide right shoulder and a four-foot-wide left shoulder. Engineers plan to widen the four existing piers in the Anacostia River to support the expanded bridge deck. These widened piers would be supported by new foundations adjacent to the existing ones. The downstream bridge (Corporal Kevin J. Walsh Memorial Bridge) would be converted for use by local traffic, connecting 11th Street near the Washington Navy Yard with Martin L. King Avenue, which would be converted to two-way service as far south as Good Hope Road in Anacostia. The downstream span would accommodate four vehicular lanes, with the outer lanes reserved for a future shared-use streetcar lane. It also would have two multi-use paths for pedestrians and cyclists (six feet wide along the northbound lanes and 14 feet wide along the southbound lanes). The unused ramps at "Interchange C" that were to connect the 11th Street Bridge to the Barney Circle Freeway would be removed. The under-utilized "stub" section of the Southeast / East Leg Freeway between the 11th Street Bridge approach and Pennsylvania Avenue would be converted into a four-lane boulevard, and the existing grade-separated interchange at Pennsylvania Avenue would be replaced by a rebuilt grade-level Barney Circle. South of the Anacostia River, a newly built directional "Y"-interchange would supply the "missing moves" between the Anacostia Freeway and the upstream freeway bridge. The downstream bridge (11th Street / Martin L. King Avenue) would be served from the Anacostia Freeway by slip ramps. The $465 million bridge and interchange replacement project began in December 2009 with a tentative completion date of 2014; the "missing moves" part of the project could be finished as early as 2012. Engineers plan to maintain three lanes of traffic in each direction across the Potomac during the length of the project. As part of the project, the DDOT filed a request with the FHWA to re-designate the 11th Street Bridge connection between the Southeast and Anacostia freeways as part of I-695 (it had been I-295); it also plans to remove the I-295 designation from the Southeast / East Leg Freeway stub that will be replaced by an urban boulevard. A REPLACEMENT FOR THE UNBUILT EAST LEG: Following the cancellation of the proposed East Leg Freeway (which in its final incarnation was to connect the Southeast and New York Avenue freeways) in 1978, District officials advanced a proposal for an extension of the Southeast Freeway past its Pennsylvania Avenue terminus to the Anacostia Freeway. First proposed in 1982, the I-695 extension, which was intended to relieve congestion on Pennsylvania Avenue and the John Philips Sousa Bridge, was estimated to carry 77,000 vehicles per day (AADT) by the early 2000's. The 1.5-mile-long, six-lane Barney Circle Freeway - named for the rebuilt circle under which it was to pass - was to cross the Anacostia River over a new span that was to parallel an existing railroad bridge. A new interchange with the Anacostia Freeway was to furnish the missing interchange movements (eastbound I-695 to northbound DC 295; and southbound DC 295 to westbound I-695) that were not provided at the 11th Street Bridge interchange. The Barney Circle Freeway proposal included a four-lane boulevard spur along the Anacostia waterfront that was to connect the freeway with the East Capitol Street (Whitney Young Memorial) Bridge. The proposed boulevard through Anacostia Park, which originally was slated for use by the East Leg Freeway, was intended to relieve congestion in the area of RFK Stadium. Since the Barney Circle Freeway and the boulevard spur were to be built through Federal parkland (which itself was used as a landfill until 1935), no private property condemnation was required. However, a total of 29 parkland acres (17 for the freeway and 12 for the boulevard) were to be acquired. For the next decade and a half, this parkland acquisition proved the main point of contention. Joining environmental groups in opposing the project were preservationists who feared adverse impacts on the nearby Congressional Cemetery. In light of these concerns, District officials dropped the boulevard spur toward the end of the 1980's. In 1994, a coalition of civic and environmental groups filed a lawsuit to halt plans for the freeway. They contended that an alternate proposal to build new ramps to supply the "missing moves" between the 11th Street Bridge and the Anacostia Freeway would cost less while having a less detrimental affect on nearby communities. (The DDOT adopted this proposal in 2004 for the 11th Street Bridge reconstruction project.) Nevertheless, the proposal got through the difficult step of approval by the Federal Highway Administration (FHWA) and Environmental Protection Agency (EPA) in 1996, and a $15 million construction contract was awarded in December of that year. Despite these approvals and the support of two former mayors, Eleanor Holmes Norton, the District's non-voting delegate to the House of Representatives, declared the Barney Circle Freeway dead on March 3, 1997. The $200 million slated for the project was reallocated for other projects such as the reconstruction of the Southeast and Southwest freeways. RE-ROUTE ONTO THE 11th STREET BRIDGE: To eliminate motorist confusion, the I-695 designation should be signed along the Southeast Freeway and rerouted onto the 11th Street Bridge toward the Anacostia Freeway (I-295 and DC 295), as per the request filed by DDOT. Guide signs would read "I-695 EAST to I-295 / DC 295" and "I-695 WEST to I-395." The existing Southeast / East Leg Freeway spur that will be converted into an urban arterial should be renamed "Robert F. Kennedy Boulevard." SOURCES: The Comprehensive Plan for the National Capital and Its Environs, National Capital Park and Planning Commission (1950); "50 MPH Traffic Loop Would 'Feed' Central DC" by Robert C. Albrook, The Washington Post (12/04/1955); Inner Loop Freeway System, De Leuw, Cather and Company (1955); "Bid Date Set on First Link of Southeast Freeway" by Paul A. Schutte, The Washington Post (12/28/1962); "DC Highway Officials Set To Open New Section of Southwest Freeway," The Washington Post (8/22/1963); "Section of Southeast Expressway To Open," The Washington Post (10/03/1965); "250 Marchers Protest Southeast Freeway Link" by Katharine Gresham, The Washington Post (9/18/1966); "War Over City Freeways Is Entering Decisive Stage" by Jim Hoagland, The Washington Post (1/23/1968); "City Drafts Bill Seeking Truce on Freeways" by Peter Milius, The Washington Post (4/05/1968); "Three Highway Projects Pushed in City" by Martin Weil, The Washington Post (8/22/1968); "Barney Circle Gone, but Will Return" by Jack Eisen, The Washington Post (6/19/1971); "New Bridge, Highway Planned" by Paul Hodge, The Washington Post (11/02/1982); "DC Plans To Link Two City Freeways" by Stephen J. Lynton, The Washington Post (9/26/1983); "You Thought the East Leg Was Dead? Welcome to Barney Circle," The Washington Post (12/20/1987); "Panel Approves Barney Ramp; Mayor To Decide on Anacostia Highway Link Soon" by Elizabeth Weiner, The Washington Post (9/16/1993); "Suit Seeks To Stop DC Plans To Build Connector Highway" by D'Vera Cohn, The Washington Post (5/13/1994); "DC Freeway in Limbo" by John Capozzi, The Washington Post (8/21/1995); "Environmental Assessment: Finding of No Significant Impact, Barney Circle Freeway Modification Project," Environmental Protection Agency (1996); "Norton Declares Barney Circle Freeway a Dead End" by Vernon Loeb, The Washington Post (3/05/1997); "DC Roads Take Turn for the Better; $400 Million in Work Getting Done in City" by Alice Reid, The Washington Post (10/12/1997); "DC, USDOT Sign Agreement With Contractor To Preserve, Enhance City's Major Bridges and Roads," Federal Highway Administration (6/19/2000); "Southeast Freeway Could Go Under: New Six-Lane Boulevard, Tunnel Would Boost Area Development" by Stephen C. Fehr, The Washington Post (10/09/2000); "Road Project To Aid Sousa Jams, Bypass To Divert Commuter Traffic" by Lori Montgomery, The Washington Post (5/17/2005); "11th Street Bridges Assessment Digested" by Jacqueline Dupree, The Washington Post (10/11/2007); "Highway History: Transportation's Role Leading the Way in Transforming the Nation's Capital" by Michael Hicks, Federal Highway Administration (8/18/2008); Scott Kozel; Scott Oglesby; Alexander Svirsky; Douglas A. Willinger; William F. Yurasko. I-695 shield by Ralph Herman. Lightpost photos by Jim K. Georges. Southeast Freeway exit list (coming soon).